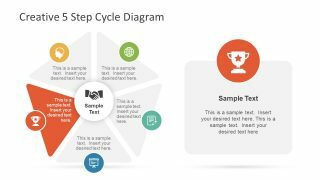 The Creative 5 Step Cycle Diagram of circular or cycle process flow template is a strategy model presentation. 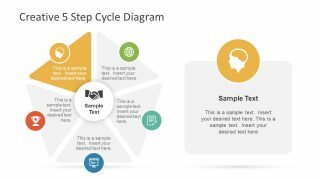 Suitable for illustrating business, marketing, processes and development planning concepts in five stages. 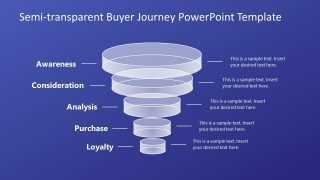 This PowerPoint contain ready-to use diagram design for professional business presentations. For example, create an instruction manual for a specific procedure or process in a project. 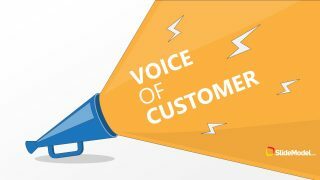 Such as, communication cycle, development methodology, continuous process of monitoring and control etc. 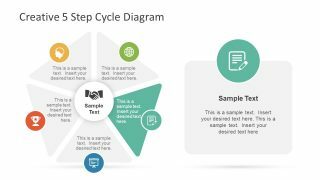 Hence, use a 5 step triangular diagram template to demonstrate organizational plan in professional manner. 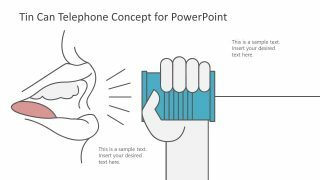 A simply awesome and well structure design of PowerPoint is an effective tool to make an impact on audience. 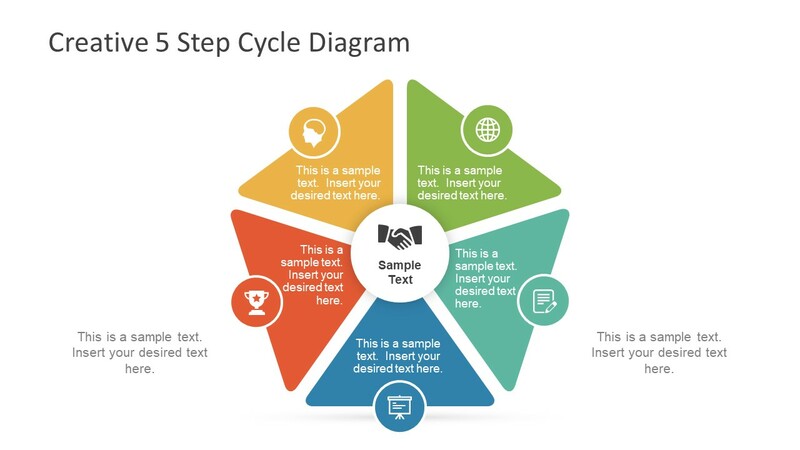 This Creative 5 Step Cycle Diagram has triangular segments creating a circle to depict a circular lifecycle. 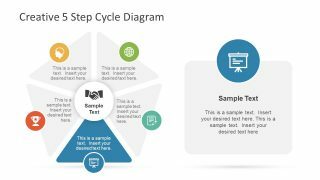 The PowerPoint contains 6 slides of circular diagram flow has one overview template as main slide. Further five slides focus on one segment each individually. All the sections of 5 step cycle have infographics to as visual illustrations of the stages. These flat infographics include, human head, globe, document, slideshow and trophy. The placeholders are available to insert titles and necessary textual information for each stage. 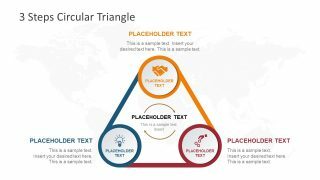 The eye-catching triangle shapes of a flat design vector PowerPoint diagram increase the visibility of content. Moreover, the concept stays longer in viewers mind through pictorial representation. 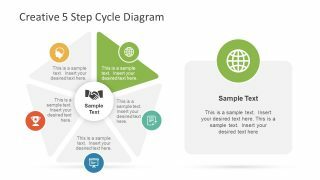 The editable shapes in 5 step cycle diagram of creative PowerPoint assist users to adjust colors and sizes. Such as altering the colors of triangles in shape fill or outline or increasing and decreasing the figures by dragging. Also, change the entire theme of the template but selecting desire pallet in variants option of design menu. Similarly, change the background in background style option which gives plain, gradient and texture styles to choose from. All the images are separate PowerPoint shapes which makes it easier to change the position like moving and replacing them.